Antimicrobial, antiseptic and stimulating. This incredibly powerful antimicrobial oil is distilled from the herb Thymus vulgaris, and oil is one of several different chemotypes that are used by aromatherapists to treat a wide range of conditions. 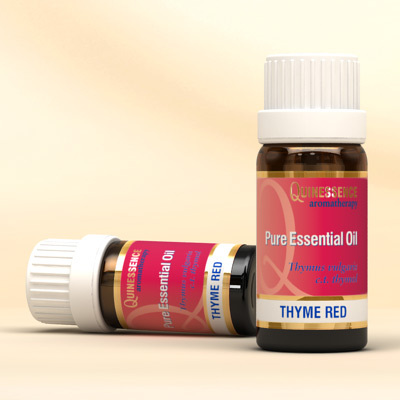 Red Thyme Essential Oil is the strongest type of all the oils obtained from this species and has a wide spectrum of uses. Red Thyme Essential Oil inhibits fungal infections, bacteria, viruses, and is a circulatory stimulant, which makes it ideal in massage blends to combat fatigue, increase the mobility of stiff joints and ease muscular aches and cramps. A few drops of this oil in a diffuser or on a tissue can be inhaled to clear blocked sinuses with the added benefit that it fights off viral infections and purifies the air.